I've never submitted a Freedom of Information request, but I like to pay attention to those that reveal fresh facts. One of these has recently caused TfL to release a full list of bus stops and their geographic locations. The database is massive, containing 19937 bus stops in total, but also highly intriguing and ripe for interrogation. So I shuffled the coordinates columns to discover the northernmost, easternmost, southernmost and westernmost bus stops in Greater London. And yes, I've visited them all. 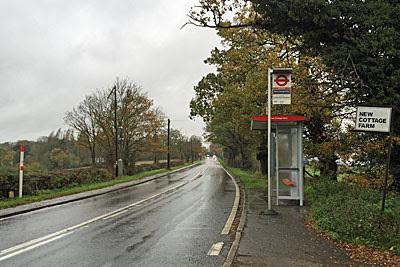 This bus stop stands on Plumridge Hill, a remote ridgetop on the winding road from Enfield to Potters Bar. London's proper rural out here, hence the nearest building is a farm, closely followed by an independent prep school surrounded by fields. Its pupils probably form a large proportion of those who use the stop, the walk to any neighbouring built-up area being both too long and too dangerous. I made the mistake of visiting in the middle of a storm, the driver giving me a second look as I alighted in the middle of almost nowhere in conspicuously inclement weather. The view must be lovely at other times, the land dropping away beyond the hedge to reveal a rolling landscape of Green Belt fields. A public footpath crosses the road here, descending a steep incline to follow the headwaters of the Salmon's Brook before climbing the valley to Stagg Hill. I looked at the mud, and then at my footwear, and decided against. In the opposite direction the footpath heads north where it swiftly meets the M25, and ducks beneath, the motorway here marking the edge of Hertfordshire. My best means of escape on foot should have been west along the pavement, a couple of hundred yards to the Greater London boundary and then on to the huge roundabout at Junction 24. But the rain had created a large puddle in the roadway, and almost as long, and I realised I risked almost certain drenching as the steady stream of traffic sped by. So I got to wait 20 minutes for the next bus, enormously thankful that there was a shelter, but less so that the rain was still driving in from the one unsheltered side. Lovely spot, wrong time. The northernmost TfL bus stop is outside London, but only just, within the confines of Waltham Cross bus station. 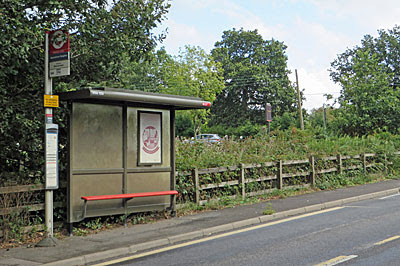 Hertfordshire Council believes in using its own bus stops, rather than TfL interlopers, so none of the stops in Potters Bar, a mile or two further north, are roundel-topped. Most Londoners don't realise just how far east their home city goes. Past Romford, past Upminster to the village of North Ockendon - the only settlement inside the capital but outside the M25. It's rural in a slightly drab way, a landscape of flat fen fields and kennels, of pylons and lacklustre golf courses, as befits somewhere that by rights should be in Thurrock. The heart of the village is rather nicer, with a 12th century church and the remains of a moat, but that's down a dead-end lane inaccessible by buses. Instead traffic doglegs round more ordinary lanes, taking in cottages and the local pub, and importantly for us, the occasional isolated homestead. Home Farm Cottage is the last building before the Greater London boundary, a suburban-style farmhouse built right up to the road beside the speed bump and the Welcome to Havering sign. Its leaded lights and irregular wall would look more at home on a housing estate, but the long barn out back looks more appropriately ex-agricultural. 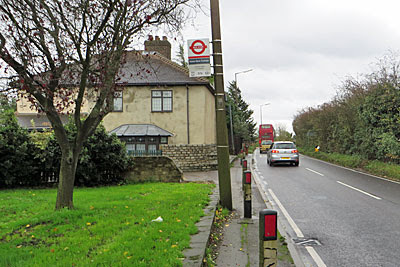 TfL have kindly put in a pair of bus stops solely for the residents and those of the house nextdoor, in Thurrock, though their fleet of fenced-off vehicles suggests they rarely avail themselves. Two red bus services stop here, which is damned good for what by London standards is essentially nowhere, but one of these is the 347, TfL's least frequent bus service (running only four times a day, Sundays excepted). The other is the 370, a double decker which heads onwards to (considerably larger) South Ockendon and thence to Lakeside, and hence is often quite busy. But here on North Road, surrounded by ploughed-up fields and hawthorn hedge, not so much. The next two bus stops down the road, at Grove Farm Cottages and Grove Farm, are fractionally further east. But (by a squeak) the easternmost TfL bus stop is rather further north in TOWIE country, outside Brentwood Sainsbury's, at the end of route 498. Not only is this the southernmost bus stop in London, it's also the highest above sea level. And that's convenient because it meant I'd already been, as part of my quest to visit the highest points in every London borough, and I'd taken a photo. My latest journey between the northernmost and easternmost bus stops had already taken me over two hours, so it was a relief not to have to reach this distant Bromley outpost before nightfall. My target would have been on the main road between Biggin Hill and Westerham, specifically at Hawley's Corner, a sixway junction below the brow of Westerham Hill. More specifically that's at the southern end of the hamlet of South Street, hence the need for a bus stop. A line of detached homes and large bungalows spreads widely behind fences and well-trimmed hedges, leading down to a garden centre on the corner, this marginally into Kent. But the most interesting place served by this southernmost bus stop is the Shampan Indian restaurant, or more specifically the cottage at the front of the car park. There's quite a refreshment-based history. Until a few years ago the main building was a pub, The Spinning Wheel, part of the Brewer's Fayre chain. In less commercial times it used to be a tearoom serving light luncheons and cream teas, the tiny thatched cottage apparently accommodation for staff. And if all that sounds charming, you're probably too late. A rather more scenic view is available just up the road, at the top of Westerham Hill, where the high ridge of the North Downs drops suddenly away revealing miles and miles of wooded Weald. The twin bus stops just before the steepest gradient are in Kent, and go by the less glamorous name of Graham Hall Coachworks - a former motor repair yard (behind which is the county's highest point). 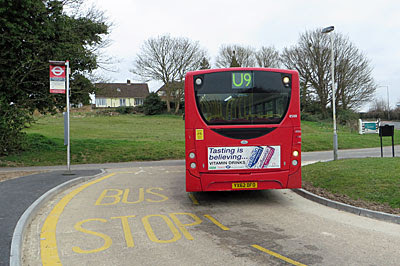 As many as ninety TfL bus stops are located to the south of Westerham Heights, specifically on bus routes to Dorking, Redhill and Westerham. The southermost is at Pixham Lane, just to the north of Dorking station (the 465's stop-offs in the town itself being roundel-free plates). And thankfully I didn't have to make a special visit to this one either. It's 35 miles from North Ockendon, the full width of London - by bus a five and a half hour journey! It's also the starting point for section 13 of the London Loop (and the endpoint for 12) so I've been more than once. The stop in question is in the Colne Valley, a rather scenic spot, down a steep lane heading west from the centre of Harefield. The road starts out built-up, then passes a well hidden council estate, then opens out to reveal fields of grazing horses stretching down to the Grand Union. On the far side is the M25, getting its third mention in today's post, and a string of of water-filled gravel pits at the southern tip of Hertfordshire. These don't need a London bus service so the U9 stops short, which also avoids having to cross the narrow twisty bridge across the canal at Coppermill Lane. There's only one bus stop at Harefield West, a pull-in and turn-around for the U9, which ventures this way in one direction only. Outbound buses drop in briefly before heading back up the 1 in 10 hill to Harefield Hospital, where they pause awhile before returning to Uxbridge direct. Alight here for a handful of outer London cul-de-sacs, various minor commercial units and a vintage pub named after a misspelt Japanese fish. At least there's a metal London Loop plaque should you randomly disembark and suddenly decide to walk five miles to Moor Park. Of the four compass points west feels the least remote, but it's still a long way home. Staines and Denham are also served by London buses and both are further west. But the westernmost TfL bus stop is nowhere near any of these, it's in the centre of Slough outside the Queensmere Centre. Don't feel the need to visit specially.